Itacaré is rich in beaches, green landscapes, food, music, markets endless parts that make the whole such a memorable place to visit. It almost seemed like a challenge to pick out the best parts of Itacaré. Somewhere during my visit however, I realized that the spark that makes Itacaré such a genuine and special place is the people that make all its best things come to life. Whether you’re on the way to the beach, the market, or the bank, you will always run into tiny humans playing on the streets, as these just so happen to be their playground Itacare’s children take first place in most energetic with their games of soccer, bike races, chases, and simple adventures bringing to life whatever they can find, without the need of any touch screens. Even during their long daily walks from school, you find them laughing and smiling at each other. 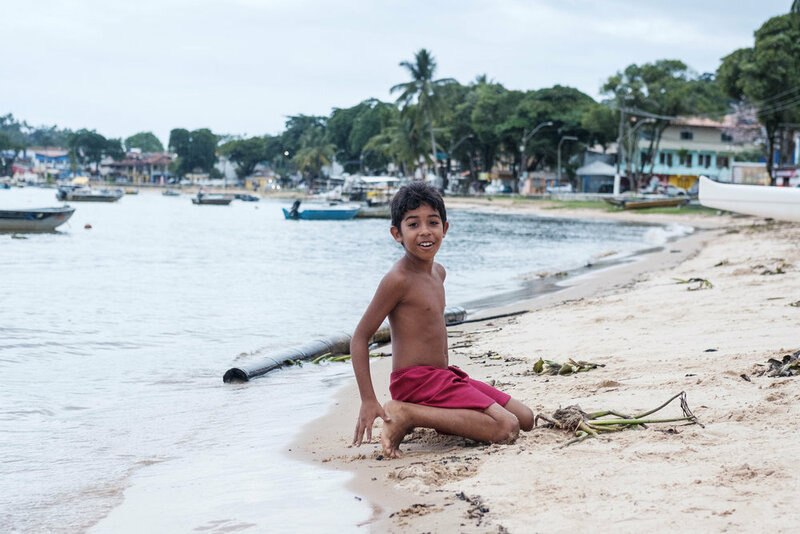 Their imagination and independence on the streets is one of the things that makes strolls through Itacaré a little extra special, no matter what time of day. It can certainly be difficult to open up and make the best out of audio classes when it’s your first-time speaking Portuguese to real people. However, the local people of Itacaré are always open to helping you understand and improve. You may hear them chuckle somewhere within the conversation—at least I did when I attempted to speak my unknown vocabulary with slurred Spanish. You certainly can’t rely on the people speaking to you in English, and this is certainly a perk for all learners. The people’s approachable manner makes it easy to strike a simple conversation, and this is the best way to practice and learn the true language. Itacaré is a community—one that everyone is a part of regardless of duration of stay. The local people of Itacaré never fail to say “Bom Dia” “Boa Tarde” or “Boa Noite.” This was certainly a new one for me, as this isn’t the case in most bigger cities. It may seem like a minor detail, but it’s one of the essentials to Itacaré’s warm and inviting community. Throughout your time, you will see more and more recurring faces, the smile and wave you give will be reciprocated, and you will feel a warm connection to the beautiful community. Nights in Itacaré are unlike any bar or club that many visitors are used to. From Salsa night to Jam night, the music in Itacaré’s venues is a blend of authentic, cultural sounds, with a modern style that gets the night going. The secret to the vibrancy in Itacaré’s nightlife is in the talented musicians behind the instruments and microphones onstage. Additionally, the atmosphere is boosted by the supporters who always stand front row and dance through the night without stopping. I found the endurance, talent, and energy of these people to be quite impressive. It’s no doubt that Itacaré is full of amazing foods—endless combinations of traditional Brazilian and foreign tastes. The people behind these meals put in their heart and cultural identity into every recipe they make, and this is what makes every restaurant so exotic. The homemade style of cooking is all thanks to the loyalty that each restaurant has for their cultural background. The service tops of its great flavors through the wonderful people that bring in energy to their work every single day. No matter how many tapiocas made, each one is beautifully crafted and served. My personal favorite. The relaxed way of life in Itacaré allows people to enjoy every single moment. In bigger, more developed cities we tend to be more used to being on the go, planning what comes next, and trying to fit in 100 things into one day. Things in Brazil don’t always run as smoothly and quickly as we are used to, and the people of Itacaré know this. Things break down, the power goes off, and things get rescheduled—and this is a great thing! It allows people to be creative, find alternatives, give attention to things we often oversee. From the local people, visitors learn patience, and through this patience, one can take a deep breath, and enjoy whatever the beautiful town gives you at that very moment.